This post is part of a blog hop in honor of World Down Syndrome Day on March 21 — the date is 3/21 for the three copies of the 21st chromosome that cause Down syndrome. (It will surprise no one who knows me that I am a day late on this). Soon we were cracking up because I was asking, “What’s the opposite of nose?” and her little sister would say “No nose,” and so forth, with all of the body parts. The conversation came around to ourselves. The opposite of little sister was “not crazy” and the opposite of big sister was “not weird,” and the opposite of me was probably something like “nice.” Then the girls asked me what would be the opposite of their brother, who has Down syndrome. I thought for just a few seconds when it hit me: boring. My son is many things: full of energy, willful, persistent, hard to motivate, uproariously funny, frustrating, defiant, loving, silly, curious and strong. But he is anything but boring. He has never been boring. Not when he was learning to crawl and would lie on his belly and shake his legs in the air furiously behind him for a happy dance. Not when he lights up like a Christmas tree at the sight of a dog. Not when he says “No, mine’s!” about every toy that enters the house that someone else tries to play with. Not when he puts on a “show” by using a blanket as a cape and pretends to be his latest favorite hero/princess/super pig. Not when he shrugs his shoulders at an important question (“Where did you put the remote control?”) and says “I… don’t… know.” There is something particularly enchanting about hearing my language-delayed son learn the correct use of a phrase that rolls so easily off the tongue for most of us. A typical day for him starts with me rousing him from bed and him grumping about getting up, possibly calling me “meanie,” before laughing and digging his head into my neck as I pick him up and carry him downstairs. (I still carry all the kids down in the morning if they don’t come down on their own, just because I can and it reminds me they are still my babies.) He goes to the bathroom then runs for his robe and then if he sees that his big sister awake, he tells her to “Stop it,” with a hurt face, even though she hasn’t done anything to him at all – retribution for all the times during the previous day that she’s pestered him. He’ll get to the breakfast table and act all surly because I won’t let him dump ALL the milk in his cereal like he wants to. Later, he’ll get dressed and put his shoes on the wrong feet no matter how much I remind him not to and despite the fact that I have written R and L on them (correctly) and he knows how to read R and L and what they stand for. The most interesting part of his day probably happens at school, which I am not privy to. But I can tell you that his school is an incredible place, where teachers have great respect for their little charges and where the children often direct their own learning. My son has become quite taken by the camera this year, and his teachers tell me that he’d rather stay behind the camera than in front of it. They send me some of his work once in a while. 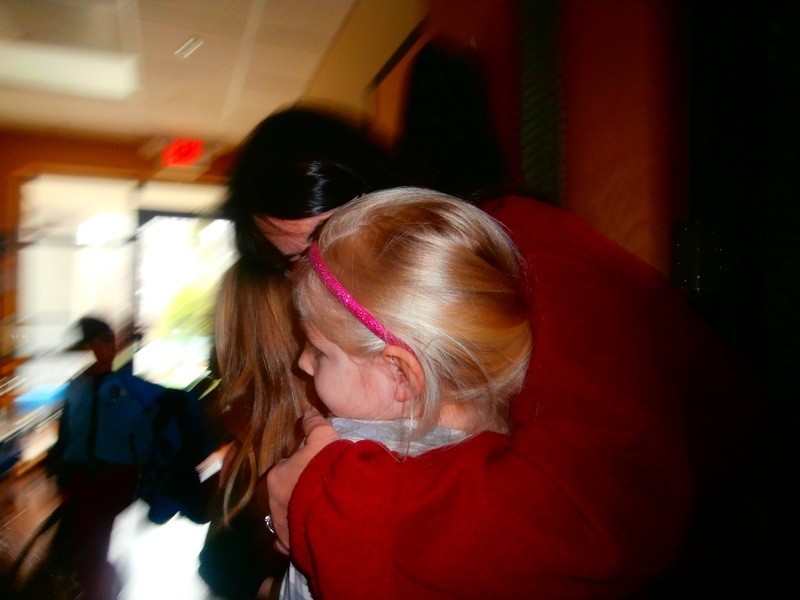 Here is a picture of one of his best gals being hugged by a teacher. This shot shows my son multitasking. 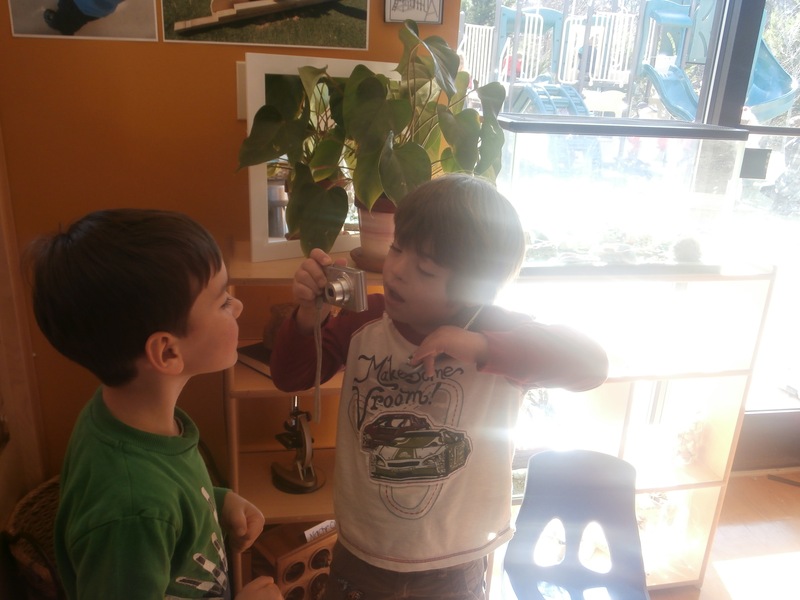 He’s talking on the phone, “Calling Mommy,” as he told his teacher, while asking a friend to pose for a picture. 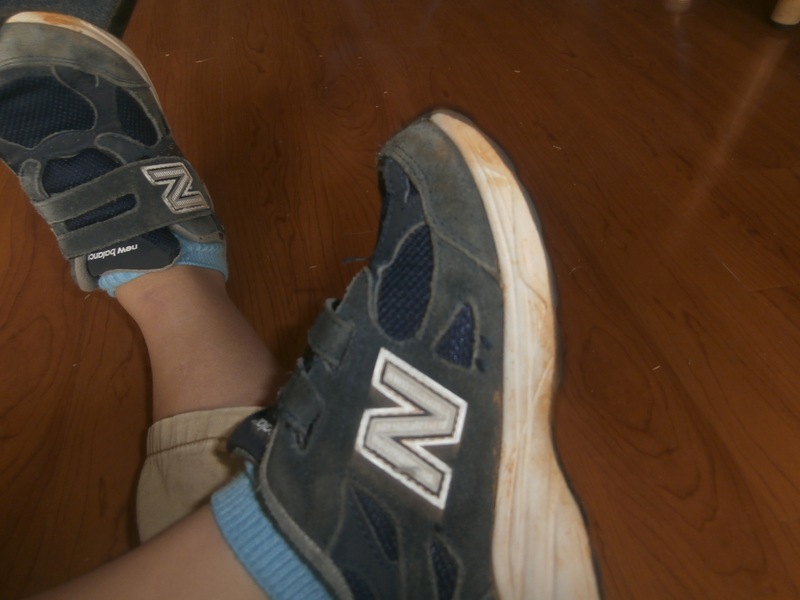 Here are a few still-life shot from his classroom environment, including his shoes — placed correctly. I love photography, and it would be incredible if he made it part of his life. This thrills me so much! The other day I had him chopping mushrooms for vegetable soup with this super cool kid knife that cuts food but won’t cut skin. That was his only task, and then he was whisked away by his sisters to play outside in our backyard. I was proud of him for doing a good job — and proud of myself for having the patience to let him help – so I was eager to show us off to my husband when he came home from work. It’s fun to recount these tales about him, mostly because I just want people to know that raising a kid with Down syndrome is equally as wacky, frustrating, heartbreaking, uplifting and fun as raising any other kid. I want to take this chance to thank some especially fascinating people who have made our son’s journey not just successful, but incredible. Everyone at school, most especially his two gifted teachers, has always done the utmost to encourage his confidence and boost him up as a full member of the community and as a student. This is a typical preschool that happens to value all children, including those with special learning needs, and they have had much success in the past with children with Down syndrome, so my son is not the first. The wonderful parents in our class have told me that their children don’t notice anything different about our son and talk about him just as they would any other child in the class. When we go to school functions, he gleefully exchanges hugs like all the other kids and is just as quickly grabbed by the hand and led away to play. In these simple acts lies a wealth of happiness for this momma. Thank you all from the bottom of my heart. These final shots reveal one big reason why he loves going to this school. Because he can be just like his twin, whom he admires above anyone else except his big sister. We put the twins in the same school but separate classes because it gives them space to breathe and have their own identities. We feel they function best when they can do this little dance of being together and yet apart. When they separate and then come back into each other’s line of sight, a tiny spark is lit. And that spark ignites a million more, creating for all of us a life most interesting. A teacher captured this sweet twin moment where he is watching her on the playground from inside his classroom. See below to view all the other entries in the blog hop!!! What is considered intelligent varies with culture. For example, when asked to sort, the Kpelle people (a tribal ethnic group in Liberia and southern Guinea ) take a functional approach. 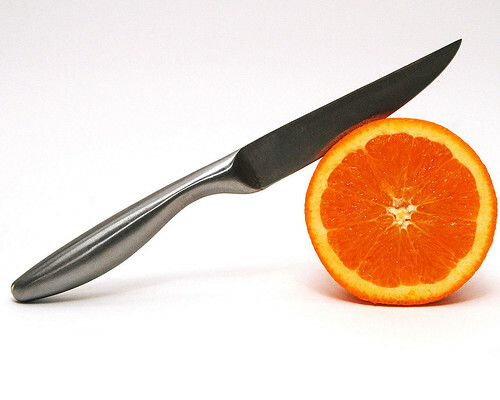 A Kpelle participant stated “the knife goes with the orange because it cuts it.” When asked how a fool would sort, they sorted linguistically, putting the knife with other implements and the orange with other foods, which is the style considered intelligent in other cultures. Credit: Wikipedia: Glick (1975) reported in Resnick, L. (1976). The Nature of Intelligence. Hillsdale, New Jersey: Lawrence Erlbaum Associates. Because of his genetic anomaly, Trisomy 21, which means possessing three copies of the 21st chromosome instead of two, my son and others like him have been deemed “intellectually disabled.” Or, a term that is thankfully falling out of favor even in medical circles, mentally retarded. To come to this conclusion, researchers and psychologists have administered IQ tests that by and large are incapable of accurately determining the true abilities of people with Down syndrome. There are a number of reasons why they aren’t completely accurate, even though they may be the best tools available. But the most obvious is that they fail to take into account that people with Down syndrome cannot often easily express to others all that they know, either linguistically or through other means of communication. Their receptive language skills (the ability to receive and process information) are typically much stronger than their expressive language skills (their ability to give back). What if people whose brains differ from the norm aren’t deficient in intelligence, but they simply have a different kind of intelligence? What if they are just part of a different “tribe,” that adapts its intelligence to the world it is functioning within? Why is this lady asking fanciful questions that cannot be resolved? Well, I do at least have an answer for that one. You see, I have been inspired by a fellow blogger, Rebecca, over at The Bates Motel. She hosted a very well received blog hop last month asking writers and readers what they would like to see revealed, medically and scientifically speaking, about Down syndrome during their child’s lifetime. First, I would like to see our culture become more open-minded about traditional intelligence, and to realize that there is beauty in the variability of intelligence. And to stop correlating the quality of a person’s “output” to his understanding of the world and to his essential worth. Some of the most fascinating people I have met are non-verbal or struggle with communication. My son is quite a talker, but he still falls into the latter category. Second, I would like to see the development of cognitive tests that more accurately measure the strengths of people with Down syndrome. There will probably always be a need for testing, at least if a person with Down syndrome is going to be part of the school system or receive therapies or other interventions. Our son is not yet 5, so we haven’t been subjected to school-based IQ testing, but I am not looking forward to that day. I hate skill-based tests of any kind, because mostly they show how my son does not “measure up.” Testers often talk to parents with sternly sad eyes, peering down at you with all of their knowledge to deliver the “news” that your child’s scores are below what is normal for his age. More to the point, these tests – any tests — fail to take into account our son’s quite sophisticated sense of humor and incredible memory for stories and songs. But I do realize that tests can have value, especially if they can measure whether a certain teaching approach or therapy is working to help him learn or to improve his memory. Like any parent, I want all of my children to learn how wonderful and complex the world is, and to retain that knowledge so they can add to it as they grow. My wish for better testing, at least, may become a reality in my son’s lifetime. And even if he doesn’t benefit much from it, just the thought that it is happening, that dedicated scientists even care about this, makes me feel euphoric. Through the magic of Google, I discovered that the Down Syndrome Research Group at the University of Arizona is working on this very thing: cutting edge cognitive assessments. The research began a few years ago, and it was big news at that time, so I’m not the first to write about it. But I was curious about the status of the tests, so I contacted Professor Jamie Edgin, a developmental psychologist and one of the group’s lead researchers, and she agreed to an interview. Basically, her group is developing tests that will piece together a “cognitive profile” specifically for Down syndrome, assessing skills across various domains like receptive and expressive language, memory, executive function and flexible thinking. This can help us, Dr. Edgin said, look at “the peaks and valleys of where skills lie.” In general, she said, the problem with an IQ score is that it represents “an average score that doesn’t mean much.” So if specific skills can be more accurately measured, I asked her, then what does this mean, say, to a parent whose child with Down syndrome is in the school system? Collectively called the Arizona Cognitive Test Battery, these tests are administered to people with Down syndrome ages 11 to adulthood using a touch screen. The tests probably won’t be ready to use in school systems for several years, said Dr. Edgin, and that is assuming an agreement could be reached with a major testing company that would distribute them in schools. Right now, the tests are still in their first year of a five-year review process. But the beauty of these tests is that they can be administered to people who are non-verbal or have limited verbal skills. Right there, this is a major departure and improvement upon traditional intelligence tests for school-age children, which rely heavily on verbal feedback. Dr. Edgin told me that some children who are non-verbal have completed the tests on the Arizona Cognitive Test Battery. “We’ve been able to tell that they can make connections between information and can show us this using a touch-screen computer,” she said, and the researchers are able to get a better understanding of their abilities without needing language. Dr. Edgin also told me that some colleagues at the UC Davis Mind Institute in Sacramento, led by the institute’s director, Dr. Leonard Abbeduto, are working concurrently on assessments for people with Down syndrome ages 6 to 23 that analyze the structure and syntax of language but are conversational in nature and based around the lives and interests of the person taking the test. For instance, the interviewer will ask about pets and hobbies and other situations that are fresh in mind, Dr. Edgin said. 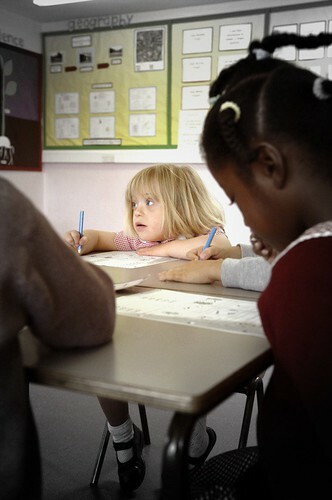 Traditional language assessments, for instance, “are not very well suited to individuals with intellectual disabilities,” Dr. Edgin said, because they require the test-taker to process a lot of information in a very short period of time and repeat back what someone else has said, which can be hard for people with Down syndrome because of working memory constraints. People with Down syndrome are very sensitive to failure, Dr. Edgin said, and they often get stressed out on more traditional language assessments because they really want to do well but they may not understand what is being asked and cannot produce language quickly. Dr. Edgin also made sure to point out that “IQ is just one measure” of functioning and that there are lots of different things that people with Down syndrome can do very well. Many, she said, “end up doing functionally really well and being integrated into the community” despite a lower IQ. This resonated with me; I have always worked hardest on functional skills with our son, like teaching him to dress himself and use the potty, rather than on academics. Of course, now that summer is winding down, I’m realizing we might need to hit the books a little harder! The test battery is also being used in the Down Syndrome Cognition Project, a multi-site investigation of the genetic basis for the high degree of variation in cognitive ability among people with Down syndrome and alongside neuroimaging studies by Dr. Julie Korenberg at the University of Utah. Research into Down syndrome is a really “up-and-coming” area now, Dr. Edgin said. When she was in graduate school she began by studying autism but was very surprised by the lack of inquiry into the cognitive psychology of Down syndrome, so she switched her focus. Now, she said, the research that she and her colleagues nationwide are doing regarding cognitive testing has the potential to answer important questions that can have an immediate impact on people’s lives. In fact, she said, this has already happened: data from the Arizona Test Battery helped a testing company that supplies some of the Arizona Battery measures to refine its methods to be targeted more effectively for people with Trisomy 21 and other intellectual disabilities. “You don’t always have that kind of immediate impact in science,” she said. “It’s very rewarding.” She said that in refining testing procedures, her group has learned – and taught other clinicians – not only how to use the tests more effectively, but how to best work with people who have Down syndrome. In Dr. Edgin’s lab, the battery of tests is also being used to measure patterns of cognitive performance in relation to factors like obstructive sleep apnea, which occurs in at least 50 percent of people with Down syndrome and as many as 100 percent according to the National Down Syndrome Society. Dr. Edgin’s team is also applying for a grant from the National Institutes of Health to fund an Arizona Memory Assessment for Preschoolers™ that would allow teachers to assess short- and long-term memory of students with Down syndrome using real objects and manipulatives. This would be at least six or seven years away from being put into use if the grant is awarded. Throughout our conversation I got the very distinct sense that here was a person who truly cared about the “subjects” of her tests. She took great care to explain how the new tests would play to the strengths of people with Down syndrome and give a broader, more nuanced picture of their abilities. I never got the sense that she thought people with Down syndrome were in need of fixing, which is what we parents often worry that science wants to do to our children: either “fix” them, or eliminate others like them from the future population. So I felt comfortable asking her a few philosophical questions about the scope and purpose of drug research. (For instance, Research Down Syndrome, which is supporting the work that Dr. Edgin’s group is doing, also finances inquiry into drug therapies to improve cognition and memory.) Questions about this have nagged at me, and I know they have for others too. Of course no one has definitive answers to such heavy questions, but I wanted an insight into the thinking of this particular scientist, who is on the front lines. Parents worry, I told her, that all of this research into medicine to alter the brain functioning of people with Down syndrome is somehow aimed at changing them, because we worry that society does not appreciate them for who they already are. It’s one of those things, she went on, “that if a drug were to go through and be marketed, parents would have the option to try it. It may give their kid a boost, it may not. But we’ll never know if that boost is available to some children unless we go through the trial.” For example, some parents give their children a cocktail of vitamins in the hopes it will improve memory or cognitive functioning, and anecdotal success is reported but these supplements have not undergone clinical trials. Going through the whole process to get a drug that is regulated by the FDA, she said, is much more effective than having lots of different supplements that are not tested for efficacy or unregulated. As for me, I’m not sure I’d be jumping up and down at the chance to give my son a medicine that may provide a “brain boost.” As things stand right now, he’s doing great, but I’m aware that his need for complex thinking will only grow as he gets older. I imagine by the time such drugs are thoroughly tested and approved for use, my son will be a teenager or nearly so, and we’ll have a family discussion about it then. But all this is not about me, or him. It’s about the entire Down syndrome population, and some families may welcome this option, so I am heartened to know this is an avenue of research. One other thing I was curious about: Is Dr. Edgin concerned that the recent development of prenatal tests to screen for Down syndrome at very early stages of pregnancy, thus potentially making it easier for women to choose abortion, will make the need for Down syndrome research obsolete? “At the end of the day, it takes a while for these things to be implemented,” she said, meaning the rollout and usage of the new prenatal tests, the effects of which it is still too early to determine. Thoroughly Modern Messy receives nothing in exchange for talking about Dr. Edgin’s work; this post is meant only to inform. Funding for the Arizona Cognitive Test Battery is provided by the Down Syndrome Research and Treatment Foundation, Research Down Syndrome, the Arizona Alzheimer’s Research Consortium and the Anna and John J. Sie Foundation. “But, we are seeking funds at the University of Arizona for our work, including the gift of a chaired professorship for me so I might be able to build our research and training program in Arizona and see many of these projects through to completion,“ Dr. Edgin said. For more information on what her group is working on, click here. Dr. Hebert had a great answer to my question, and maybe you’ve heard the answer before, but when she explained it sounded like a revelation — have each child create a Book Box of his or her own. “With young children and elderly people,” Dr. Hebert said, “what do they want? They want choices. They need to feel they are in control.” So have your child create a Book Box. “It can be a Tide box with a handle,” she said, “or some strong cereal box, or big plastic tubs.” Basically, any deep container will work. Then you and your child both fill it up with many different types of reading materials, in addition to books that the child enjoys reading. These might include maps, cookbooks, menus, phone books, dictionaries, catalogs, newspapers, magazines, comic books, or AAA tour books. For pre-readers, especially kids with special needs who are often strong visual learners, wordless picture books are a great choice to help with vocabulary development and word retrieval. You can make your own wordless books, or find them with a quick Internet search. Dr. Hebert likes wordless books by Mercer Meyer, Alexandra Day and David Wiesner. Parents choose some things for the box and the child chooses some things — the control freak in me likes that I can choose too! (Someone has to make sure the puppy book they begged for at the library actually gets read). Set Aside a Quiet Time: In teacher parlance, it is called “DEAR” time — which stands for Drop Everything And Read. Apparently, you have to set aside an actual time for this every day and make it sound really cool. Oops! I usually make the kids sit down and read when they are getting on my nerves. Is that wrong? Your Child Can Sit Wherever She Wants: In the kitchen, on the floor, at a table, or better yet, under the table! Try outside in a playhouse or in a big appliance box that’s been converted into a hiding place. “Now it becomes fun,” said Dr. Hebert. Fill the Box With More Than Story Books: This was the revelation part to me. Book Boxes can and should include brochures from the car repair shop, restaurant menus, catalogs, comic books, maps, a kids’ magazine or section of the newspaper. Even, said Dr. Hebert, “recipe books you don’t use anymore, phone books and of course books or novels from the library that are easy and motivating for kids to practice reading with.” With all the story-type texts they are given to read, “kids begin to think reading is only for reading books,” said Dr. Hebert, “but the majority of things we read are informational: a map, or a brochure, for instance.” If your child gets too focused on reading catalogs and brochures, she advised, set aside a day once a week where they have to read a book first for a few minutes. If your child comes home with a leveled reader from school, put a special sticker on it indicating that it needs to be read first during DEAR time before moving on to other things, Dr. Hebert said. 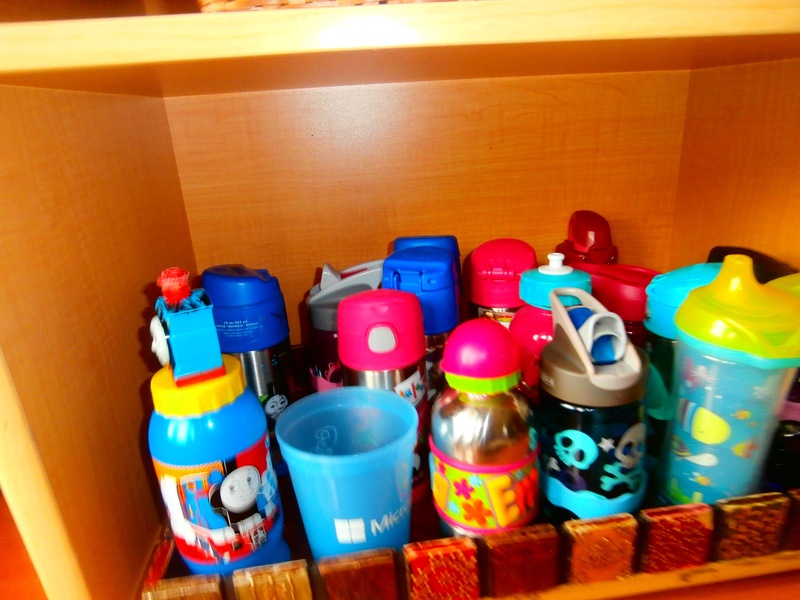 Keep It Fresh: Also about once a week, work together with your child to trade out a few items and add new ones. Some children may want to clean out the entire thing, Dr. Hebert said, and some may want to hold onto things for a long time — whatever works for your child is fine. Unleash Your Child’s Creativity: Since it is your child’s Book Box, encourage him to decorate it as he wishes, or cover it, or put stickers on it. Old wads of gum are not as good, but since this is my house, I’m guessing my girls might include a piece or two. Encourage Writing Too: Dr. Hebert says she likes to put a journal in the box too so that kids of all ages can write or scribble about the book, draw pictures of it, change the cover into their own creation, or write new words they’ve learned. “Never separate reading from writing,” she said. Part of being successful at reading is “feeling like a reader and writer,” she said. Aim High: If he’s in kindergarten and wants to put a Harry Potter book in there, great, said Dr. Hebert. “Let him page through it, see the chapters, read the Table of Contents and find the pages, look at the front cover, the back cover.” He has the freedom to put whatever book he wants in there, even if it is well beyond his comprehension. You’d Better DEAR Too: Motivate your child by doing some reading of your own — modeling is the best way to teach. Set a timer for 20 minutes, for instance, though even a few minutes is great to start. You can have your own Book Box. “I become the child,” Dr. Hebert said, “and I go through my own box and talk about all the great things I’m going to read.” For instance: “Oh, I’m having people over on Sunday, I think I’ll take out this recipe book and figure out what I’m going to make,” Dr. Hebert said. Always talk about what you are going to read and why you’re going to read it. This sounded like so much fun I couldn’t wait to try it. My kids liked the idea right away. We used a big Tupperware-type box with a lid and some plastic storage bins from Ikea that are quite cheap and easy to replace. My oldest girl, age 6 ½ and going into first grade, wanted to decorate it before she started reading, while her younger sister, who as I said is almost 4, filled the whole thing to the tippy top and then started paging through all the books. 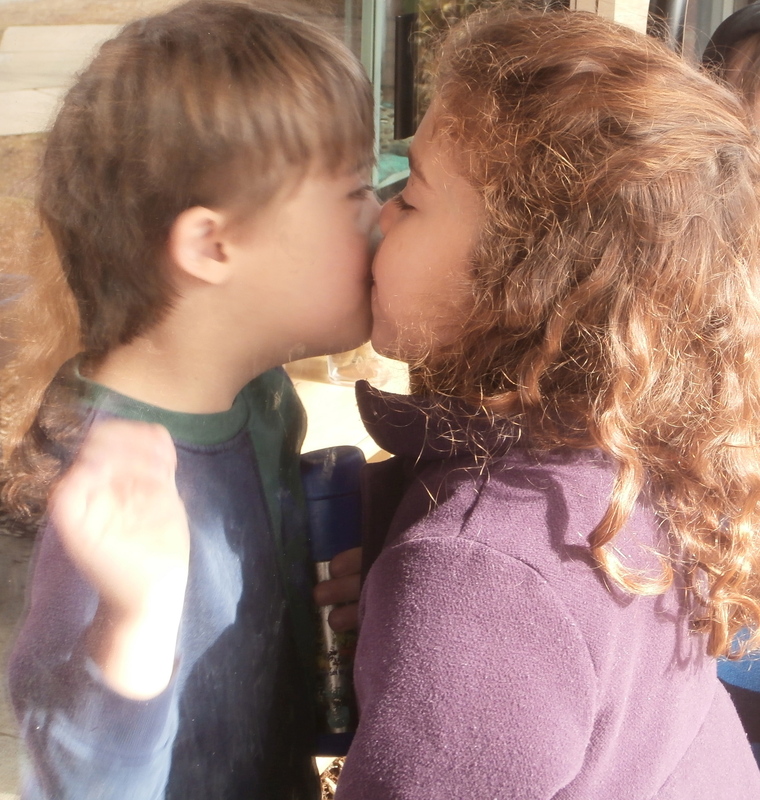 Her twin brother, who has Down syndrome, joined us later, as he was still napping while all this was going on. The miracles didn’t stop there. Her little sister found a few books that had tables of contents with little pictures next to the titles, and she was looking up different chapters by page number. This is the stubborn girl who knows her entire alphabet but says “B” when you show her the letter K because she absolutely does not want us to figure out that she knows anything, lest we start asking too many questions while she’s playing. For nearly two hours it went on like this. That’s right, I said two hours. When our son woke up from his nap, he was not too impressed with his own Book Box. He seemed miffed that I was going to sit and read my own book rather than read to him, but soon he was sharing a book with his twin and cackling hysterically and all was right with the world again. Another day, he read through the books on his own, talking himself through the pictures. Mind you, I have no problem reading to the little ones at DEAR time for a few minutes, but I want to teach them independence – and I want to read too! For the first time in months, I finished an entire magazine article while the kids read in my vicinity. That’s right, an entire article! Of more than 3 pages too – I could not believe it. We are not able to work in DEAR time every day, but you can bet that’s what I’m aiming for. You can read more tips in Dr. Hebert’s books “Catch a Falling Reader” and “Catch a Falling Writer,” published by Corwin Press corwinpress.com Her books include timeless principles for catching struggling readers and writers in grades K – 4. A big thank you to Dr. Hebert for sharing her knowledge. Please check out her Web site: http://www.conniehebert.com. There is useful information for elementary kids of all developmental types. Hello dear readers! Today I offer you a two-for-one special: in just “one” visit to my home page, you can find out about “two” very valuable items. First, this witty little post you are reading right now, and two, and I guess more important, this great article on Parents.com that I wrote with little tips and activities you can do with your babies, toddlers and preschoolers to boost their language development. The piece was written to target children with Down syndrome, but it will work equally well for any child who is a visual learner, and your typically developing children will also benefit! Please check out the resources I mention in the piece; they have been invaluable guides for me. 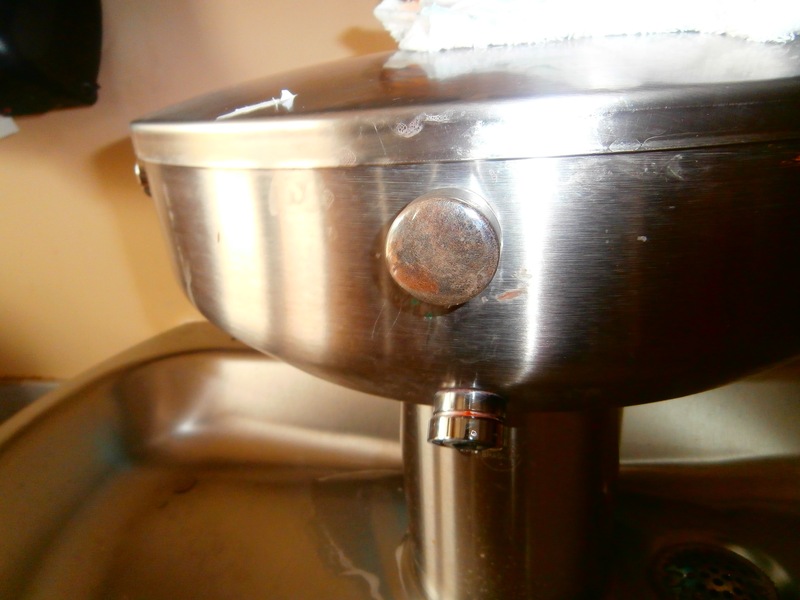 I’ve updated the “Blogroll” on my homepage. It has some great resources for parents and educators of children with special needs, especially Down syndrome. Check it out! Let me know what other web sites you have found useful as a parent, loved one, or educator of a child with special needs. Below is a short tutorial directed at my son’s teachers; a love letter of sorts, if you will. He is 3, and in a preschool for exceptional children within our local elementary school. I think these ideas apply broadly though, to all professionals and all parents whose children have Down syndrome or other cognitive disorders. I hope there are takeaways in here that apply to children of any age. Let me know what you think! Some notes from a conference presented in Charlotte, N.C., last fall by Down Syndrome Education International, a UK-based research and training organization that has been using clinical trials to study how people with Down syndrome learn for 30 years. Professor Sue Buckley is the lead scientist at DownsEd and was the featured speaker at the conference along with some of her colleagues. For more information: www.downsed.org. You may have heard that children with Down syndrome are “visual learners,” meaning that they learn better when information is presented visually rather than just spoken to them. The reason for this is that they have specific impairments in their auditory short-term memory and relatively strong visual memories. What this means is they may need visual prompts like pictures or signs in order to learn language, follow directions, or answer questions. For a one-step direction or word, no visual prompt may be needed, but if you are asking the child to complete a two-step direction or say two or more words, a visual aid may be necessary until the child has mastered this skill. About a half dozen studies have shown that reading progress is often above the mental age for language and verbal skills, and in many cases children with Down syndrome can read at age level! The researchers at DownsEd, as the organization is called, learned that many 3-year-olds could remember a visual word easier than a spoken word. Reading can be fostered in the classroom and at home with the use of letter cards or letter books — pages with a letter written in big type and accompanied by a picture of something that starts with that letter. Show the card, then say the letter sound to the child, then say the word and see if the child repeats it. Over time, you can ask the child to categorize by putting all the “b” words in one pile, the “d” words in another, etc. Studies of children naming picture cards showed that speech production was clearer when imitating (watching closely as the adult spoke the word slowly). This showed that another problem was storage and retrieval from memory, not a motor skill or vocabulary issue, although some children with Down syndrome also have oral-motor weakness that impedes their speech. Children with Down syndrome are good at matching games, so you could have a group of pictures with the word written underneath, and have the child match the corresponding picture with the word underneath. Over time, you can gradually progress to having the child match only a word to the correct picture, and then match word to word, with no pictures at all. Preschool children can start whole word/sight reading when they have a vocabulary of 50-100 words and are able to match pictures (find the one the same) and select pictures (Where is the dog?). Phonics instruction should not begin until the child has a sight vocabulary of 30-40 words, or with the rest of the class in school. Many of the early phonics skills will overlap with speech and language activities that teach letter sounds and initial consonants. The computer plays to the visual strengths of children with Down syndrome, said Professor Buckley. She said the iPad is going to revolutionize education of our children. So please keep encouraging them to use the computer and don’t hesitate to play letter and number recognition games. One fascinating tip presented at the conference is that children with Down syndrome are very sensitive to failure. If they sense they will not be able to do something correctly, they may simply refuse to do it. You may present a task to them, and they may start smiling at you or otherwise getting distracted. This may be just a behavior, but it may also be their way of trying to “get out of” doing the task. A way around this is to use errorless learning. In other words, do not let the child get something “wrong.” Assist him in getting the answers right until he learns to do it himself. For instance, if you are asking the child to point to the dog and he points to the duck, keep prompting for the right answer. Avoid saying the word “no” or “that’s not right,” or similar language. Instead, say something like, “That’s the duck, do you see the dog?” Prompt a few times and if the child doesn’t get it, take his finger and point to the dog, saying “There’s the dog!” Similarly, if you are asking the child to choose from among a group of cards and he is not finding the right one, gently push the correct one forward to encourage him to choose it. Praise him for making the correct choice and try another activity. Over time, you will slowly decrease the amount of support and prompts you are giving to the child. Perhaps the most striking yet simple idea presented at the conference by Professor Buckley is that we all should treat our children according to their chronological age as much as possible, not their developmental age. As an example, she told us about her own daughter, who is now an adult and has never had a strong spoken vocabulary. They always treated her very protectively, and she took a special bus to either school or day service until the age of 22. Around that age, she joined the “real world,” moving to a supported living situation and beginning a relationship with a young man. Finally, she came into herself, Professor Buckley said. Her daughter learned more between the ages of 20 and 30 than in the previous 20 years, she said. I love this story! Let’s all work for full inclusion for our children and have the ultimate goal of letting our adult children be adults when the time comes. I anticipate this will be harder than it sounds. Thank you for helping us get there!